Looks like the snowshoes, micro spikes and poles will remain in the closet indefinitely while I wrangle up the funds for yet another repair. No trails within walking distance here, not that I can find anyway. On the other hand, the economy is finally picking up and I am starting to see a pickup in print sales, my bread and butter when it comes to photography 🙂 Maybe it won’t be so long! 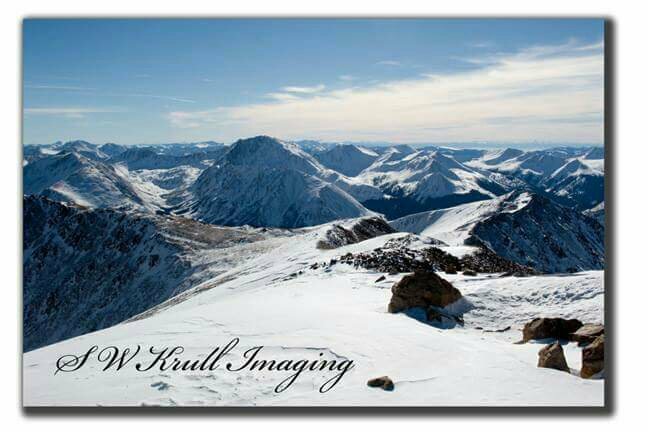 Maybe a view like this one from the summit of Mount Elbert will not be so distant after all. Also my photo lab has added a ton of new products including some that would make for cool Christmas gifts including the latest, yoga mats custom made with one of my images 🙂 just click the print sales button in the menu to bring up my image galleries and once inside a gallery just click your favorite picture to see all the cool products that are available! Wow, what an adventure today was! Last night I set my alarm for 4:30 a.m. to get an early start on my day photographing the Pikes Peak Ascent, but the alarm proved to be unnecessary as I awoke at 4:20 a.m. on my own wired up and ready to go! One cup of coffee and a couple of toasted frozen waffles later I was on my way down the pass. My parking plan worked perfectly as I pulled into the end spot in the free parking area at the middle school. A short walk down the hill and I was in the midst of the action, albeit an hour early. I needed a few minutes to get my equipment ready and talk to the race officials so that was fine with me. A couple of nice people described to me in detail how I would be able to get a ride to the peak in the media van and I just wanted to pat them on their heads and say to them, “Silly people, if you only knew me you would know that there isn’t a chance on God’s green earth that I will be in that van when it leaves.”… Got some great shots of the race start, including some of our next Runners World Cover Girl, Jill Howard 🙂 Sure enough, when the time came the media van was nowhere to be found but I fortunately ran across the guys hauling the time keeping equipment to the top and hitched a ride with them. Pikes Peak Highway is amazing. It winds around all over that mountain giving fantastic views in almost every direction imaginable. From there I could see Woodland Park and Rampart Reservoir, the Springs, South Park and from the summit you can probably see the Atlantic and Pacific if your eyes are good enough! Well that could be a slight exaggeration, but suffice it to say you can see a long ways. On my way through the Summit House at 14,115 feet I reached into the pocket of my photography vest to get my sunglasses and felt a piece of paper. What do you know if it wasn’t a $20 bill. So I bought some food and as I ate breakfast I knew this was going to be a great day! It only takes the fastest men a little over two hours to run the thirteen miles from Manitou town center to the top so that only left me about 20 minutes to get into position. I hiked down the mountain a few switchbacks and found a spot with a good view and waited for the action. It wasn’t long before I had the first place man and woman in the bag so I headed down a bit further for a different view. I had found out from Jill what her predicted finish time was and I liked my original location better so as the time for her finish drew near I hiked back up the trail to try to get a shot of her nearing the finish line. And right on time, there she was with a big smile and a greeting! After all these years I finally met her in person 🙂 At that point with almost 500 images on the chip I decided to just make my way to the top and chat with her and William for a while. So great to talk with them in person after so many years of internet friendship. Be sure to subscribe to my Examiner news feed so you will be sure to receive notification as soon as the article is published! Not many things make me happier than a new pair of hiking boots. It always seemed to me that a person’s shoes are an indication of who and what they are. A good looking pair of hiking boots are a symbol of freedom, outdoors and adventure, serious equipment befitting a mountain lone wolf. 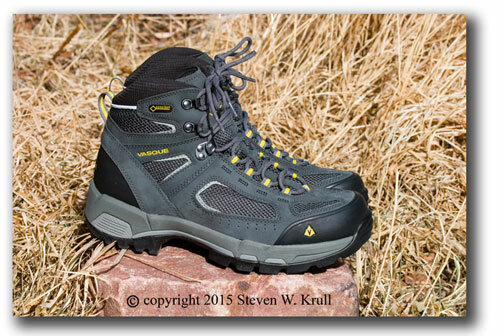 So yesterday was a big day when my Vasque Breeze 2.0 GTX hiking boots arrived for me to give a test ride. More than just a pair of shoes, they are a cool excuse for me to lace up and head out onto the rocky trails of the high peaks where I will discover how they feel in the snow, on the sharp rocks, during a stream crossing, across a boulder field and on steep climbs. Considering the delight I have received from walking in my first pair of Vasque’s, I’m quite certain that my field report on the Breeze model for the Examiner will be filled with positive comments. First things first though, the boots have been unpacked from the box and photographed before their christening in the mud, snow, rocks and ice of the Pike National Forest. Laced up and tried on, they have proven to be a perfect fit, comfortable as a glove right out of the box. I am looking forward to living in these boots for a couple of weeks, walking, hiking and climbing in them every time I get the chance. So stay tuned as we find out what the Vasque Breeze GTX is made of. Also, be sure to get your free subscription to my Examiner news feed and you will receive an email the minute my field report is available! Despite a bout of food poisoning I managed to complete my article on this summer’s ultra running schedule in Colorado. I was pleasantly surprised to see that the grueling endurance sport is catching on in my state. 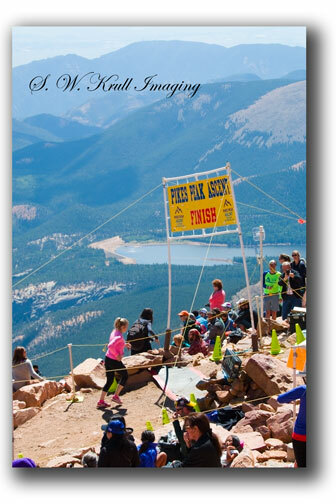 It has been a while since I have run an ultra and I was happy to find that there are still runners who aspire to finish the Grand Slam and a new challenge called the Rocky Mountain Slam, the completion of four major ultra marathons in the Rocky Mountain region. I was also pleased to find that a number of quality new events have been born in Colorado to fill out the summer schedule and give runners all around the state a chance to run close to home. Given my circumstances I will not have the opportunity to participate, but I do hope that I can get myself and my camera to one of these fine events to get some pictures and meet some of the new runners. Please stay tuned to my blog and subscribe to my free Examiner page to stay updated on the latest developments on the trail running scene.